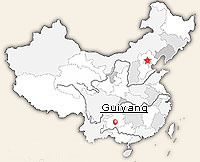 Guizhou is in the subtropical zone with a humid monsoon climate. The annual temperature in the province averages 15C (59F). Its seasons tend to merge with neither severe winter nor hot summer. This moderate climate is due to the high mountains and lush vegetation in the area, which wards off the intense summer heat and severe winter cold. The agreeable weather makes it suitable for travelers to visit Guizhou all year round. However, Guizhou has more overcast days and rainfall than any other part of the country. Influenced by this regions' diverse topography, the climate can be very diverse, which is well described by two local sayings: "Different weather five kilometers apart." and "Four seasons in one day". Raincoats or umbrellas are indispensable. While March to August is the rainy season, the rest of the year still sees quite a bit of rain. Because of the quickly changing temperatures, mornings and evenings can often be rather cool, so a windproof coat is necessary. Because most visitors come to Guizhou to experience the diverse ethnic cultures in the province, the best time to visit is during the Spring Festival and in early spring, when most of the ethnic traditional festivals are held.